A grand origin story awaits Lara Croft in the official synopsis for Roar Uthaug’s upcoming Tomb Raider movie. Coming to us by way of Vanity Fair – the same source that formally unveiled our first look at Alicia Vikander in the title role earlier this morning – the logline teases a missing father in Richard James Croft (Dominic West) and a bona fide hero in the making. Still wet behind the ears and working as a bike courier in London, the Lara Croft of Roar Uthaug’s live-action movie is similar to the one seen in Crystal Dynamics’ rebooted video game series in that the iconic figure is still finding her feet in archeology’s dangerous underworld. Vikander’s protagonist naturally has a vested interest in her tomb raiding in the sense that she’s hoping to locate the whereabouts of her missing father. That global search leads her to a remote island off the coast of Japan (Yamatai?) where Lara “journeys into the unknown.” Can we expect 2018’s Tomb Raider movie to incorporate some supernatural elements in the vein of, say, Indiana Jones and/or Naughty Dog’s Uncharted franchise? Time will tell. 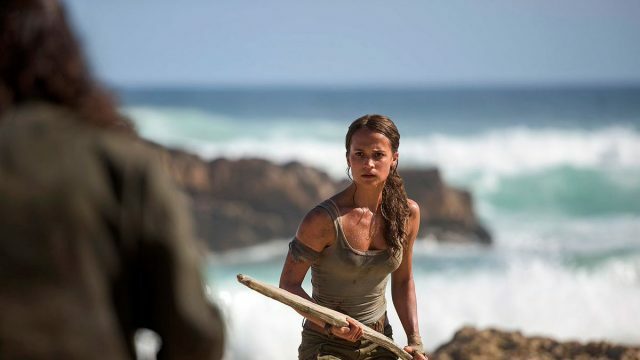 Tomb Raider is booked in for March 16th, 2018 and is by no means the final video game movie to come out of Hollywood. Further afield, we also have Stephen Gaghan’s version of The Division to look forward to, which recently cast Jake Gyllenhaal and Jessica Chastain as Ubisoft’s agents.